Swarthmore athletics have been a big part of life for Annalise Penikis ’13 since long before she entered the college classroom. At age 8 she was an assistant water girl for the women’s basketball team, writing a note to then-coach Adrienne Shibles thanking her for the opportunity and for inspiration to play the game. 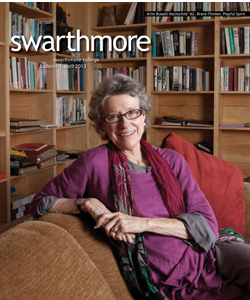 Small Craft Warnings, Swarthmore College’s oldest literary magazine, just got a face-lift. The biannual publication, perhaps best known for former editor Jonathan Franzen ’81, was reissued earlier this spring with a whole new look and feel. Swarthmore students displayed the full force of their passion to counter climate change and limit fossil-fuel extraction by participating in demonstrations this spring semester—on and off campus. The College made another huge “leap forward in the capital campaign that will support Strategic Directions [the strategic plan],” President Rebecca Chopp announced Feb. 23 during a morning meeting of the Board of Managers. One trailblazing alumnus and a social activist/writer will receive honorary degrees at Swarthmore’s 141st Commencement ceremony June 2. Entrepreneur and humanitarian Tralance Addy ’69 will receive an honorary doctor of humane letters degree, and writer and social activist Lorene Cary will be awarded an honorary doctor of arts. Standing in a meeting room 27 stories high overlooking Midtown Manhattan, surrounded by Swarthmore students and alumni, I began to revise my view of the College community—from one focused on campus life to a realization that opportunities after Swarthmore are endless, like the city lights fading into the distance.